Sixteen children of the Assumption School and Parish had First Confession on Friday, May 6, and received First Solemn Holy Communion on Saturday , May 7, 2011. Our sincerest congratulations and best wishes are extended to: Kayla, Anali, Jayden, Julie, Vinnie, Andrew, Jasmyn, Daisy, Donovan, Kevin, Joseph, Mia, Matthew, Melasia, Vincent and Sofia. We are grateful to all who have assisted these children on their journey of faith. The list includes but is not limited to, their parents, godparents, grandparents, brothers and sisters, school principal, teachers and this year's catechist Sr. Maria, MSMG. Thank you for helping to prepare our children for the greatest gift they will ever receive. 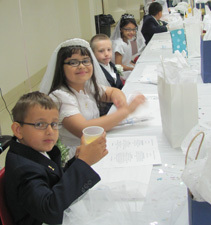 We can only hope and pray that their parents will provide the opportunities for their children to continue to receive the Holy Eucharist at weekly Liturgy (Mass).